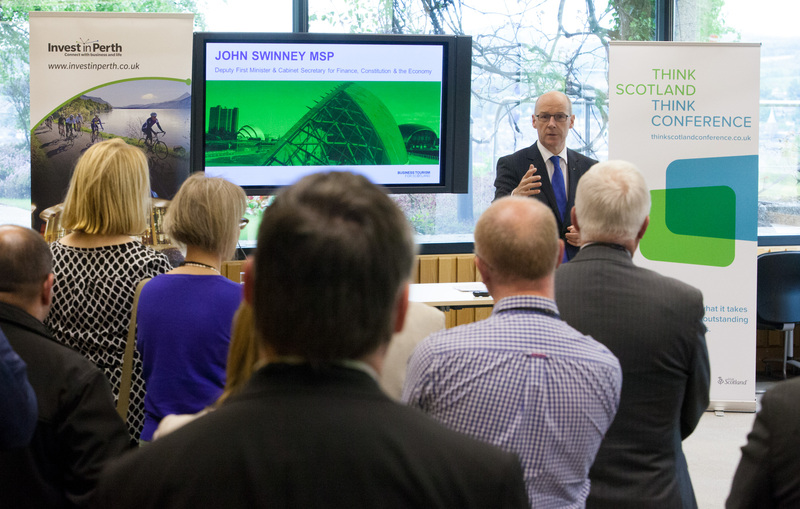 Perthshire is ideally placed to secure a larger share of Scotland’s growing business tourism market, according to Deputy First Minister John Swinney, MSP for Perthshire North. Mr Swinney joined business and public sector leaders to voice their recognition of the economic importance of the sector at the Perth leg of the new Think Scotland, Think Conference (TSTC) initiative. In his speech, Mr Swinney said: “We must utilise the wonderful combination of venues, facilities, natural environment and culture to further enhance Scotland’s reputation as a world class conference destination. Not only does business tourism – in all forms – bring tens of thousands of delegates to Scotland, but the events also act as shop window for our country and encourage return visits. Business Tourism for Scotland (BTfS) teamed up with Invest in Perth, the investment campaign of Perth and Kinross Council, to host the event on May 19 which include presentations from Stephen Leckie, Chief Executive of Crieff Hydro and BTfS representative; Sarah Butler, Chief Executive of Scone Palace, and Perth and Kinross Council Chief Executive, Bernadette Malone. The speakers presented to a packed room of delegates at Aviva’s Perth headquarters and urged those in attendance to get behind Perth and Kinross as a premier location for conferences and events. With business tourism events currently worth £1.9bn annually to the Scottish economy, Think Scotland, Think Conference aims to unlock greater business tourism benefits by engaging directly with commercial and private companies on an unprecedented scale. The event set out to provide the right marketing tools, knowledge and support to allow local business leaders to become advocates of Perth’s business tourism offering. Overall tourism brings in £465million and some 1.9million visits each year to Perth and Kinross. Developed by industry group BTfS, Think Scotland, Think Conference (TSTC) is leading the challenge to grow business tourism by £400m (21%) to £2.3bn by 2020, (21%). TSTC is being delivered as a key strand of Scotland’s national tourism strategy, Tourism Scotland 2020, co-ordinated by the Scottish Tourism Alliance (STA). COULD YOUR BUSINESS BENEFIT FROM THE HELP OF PR EXPERTS?